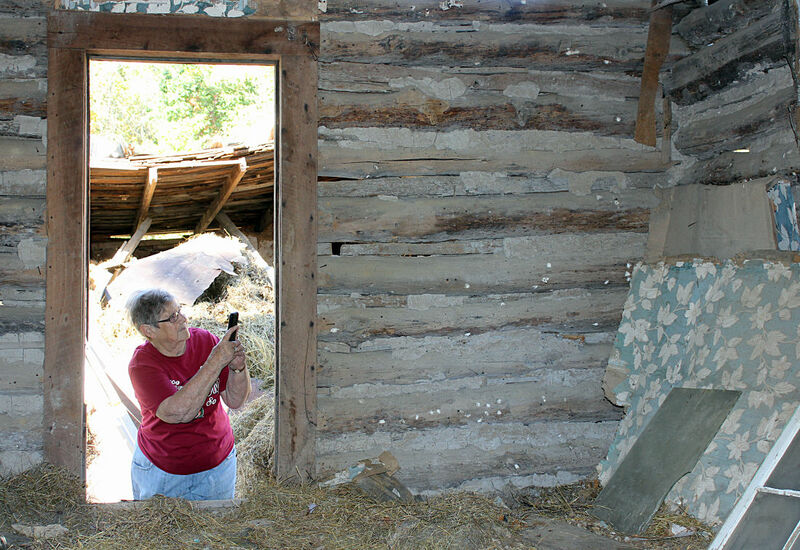 A cabin, which once sat on a rural Delaware County farm has a new home thanks, in part to the combined efforts of volunteers with Har-Ber Village and members of the former owner's family. On Thursday, Oct. 22, the cabin, built by William Anderson McElroy, traveled by way of a semi-trailer from its former location off of Whitewater Road to the Har-Ber Village grounds. The 16-foot by 15-foot cabin, which housed members of the McElroy family until 1954, will now serve as the trailhead cabin for the upcoming nature trail expansion project. As the cabin moved from Whitewater Road to Har-Ber Village, McElroy's distant relative Patti Jo Brewster Elliott, was on hand to watch. Elliot is the granddaughter of Nellie Opal and Hugh Wilson, McElroy's step-daughter. With the donation, the cabin becomes the first log cabin from Grove to be placed on display on the museum grounds. Late last year, Amelia Chamberlin, executive director of Har-Ber Village said Elliott contacted museum officials about the log cabin, concerned that a piece of Grove’s history might disappear. Elliot first approached the property owners of where the cabin was located, Clint and Tootie Longan, about moving the cabin to Har-Ber Village. Tootie Longan said the couple had discussed donating the cabin in the past, but the timing was not right. She was pleased to see the cabin find a new home at Har-Ber Village. Chamberlin said the cabin, made of round logs instead of flat, hewn logs like most of the Village’s cabins, is in need of restoration. She said a group of volunteers, led by Pete Churchill, vice president of Har-Ber Village board of directors, plan to work on the cabin's restoration. 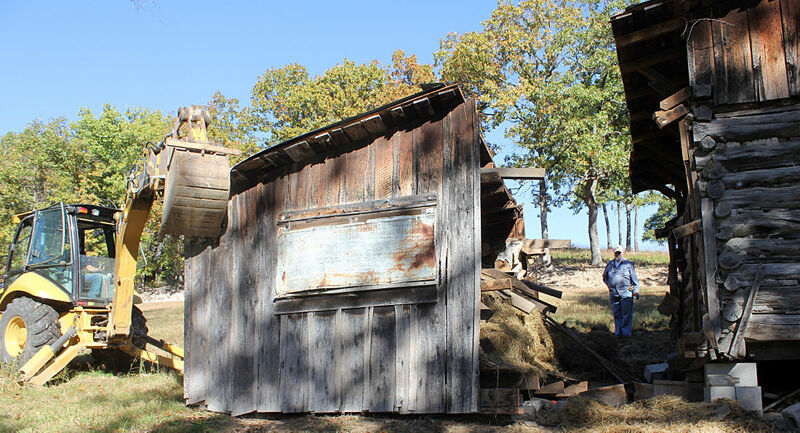 Churchill said now that the cabin has been moved to the Har-Ber Village grounds, officials plan to take it apart and begin a lengthy restoration process. Churchill likened the process to a life-size Tinker Toy project. The structure is in need of new chinking and some rotted boards need to be replaced. Churchill said the structure will be used as the nature center for the revamped and remodeled nature trail - a project volunteers hope to undertake and possibly complete in early 2016. As the nature center, the cabin will include maps of both the trail system and Har-Ber Village. Churchill said people will be able to access it year-round when completed. "This is the beginning of a major undertaking for us," Churchill said. Originally, Harvey Jones had created a nature trail on the village grounds. Heavy rains in 2007 and again during this past summer caused significant damage to the trails. Churchill said the trails will be reconstructed and added to, and will be accessible year-round once completed. He said the trails will be pet friendly and contain some ADA compliant areas. "Since the city wasn't able to compete the walking trail between Wolf Creek Park and Grove Springs Park, there isn't a walking trail in our area," Churchill said. "We plan to take our existing trail - which is a little more than a mile - and expand it into something in the neighborhood of two miles. "This cabin will become the focal point of the project." Churchill said he is working on the cabin reconstruction project with Richard Cannon. They anticipate using volunteers from the Grove Rotary Club to complete the project. The $1,100 needed to hire the house mover has been provided by a private donation. Churchill said Crossland's Construction is assisting the board of directors with developing an updated plan for the walking trail. Churchill expects the board of directors will undertake some fundraising to complete the trail project. "I think this is exciting," Churchill said. "When we started thinking about redoing our trails, at the same time we hears about this cabin. "It's all come together, and we're to the visualizing stage. This is a neat part of northeast Oklahoma's history." Churchill said he hopes the cabin will help students of all ages develop a feeling of how this area's forefathers lived. "This cabin can be used to tell the story of Delaware County," Churchill said. "It dates back to pre-statehood times, and [McElroy] lived in it until 1954. "I hope we can research this, and tell the story of the cabin and early Delaware County. It's a great story to tell and will add a lot to the history of the village." The cabin was built by William Anderson McElroy (b. 1862, d. 1954). He lived in the cabin with his wife Edna Wight McElroy (b. 1875, d. 1956) until he died in 1954 at the age of 94. When the two married, Edna McElroy already had two children from her first marriage to Albert Wight: a daughter, Nellie Opal Wight, and a son, Paul Wight. When the two divorced, Edna took Nellie to live with her and Albert took Paul. Hugh Wilson set up a blacksmith shop, and another man by the name of Bill Watson, put in a store. These two businesses were the start of Grove. This story originally appeared in the Tuesday, Oct. 27 issue of The Grove Sun.